Laddu / laddoo is one of the most popular Indian sweets. The taste and flavor of this yummy treats depends upon the ingredients used for making this sweet. 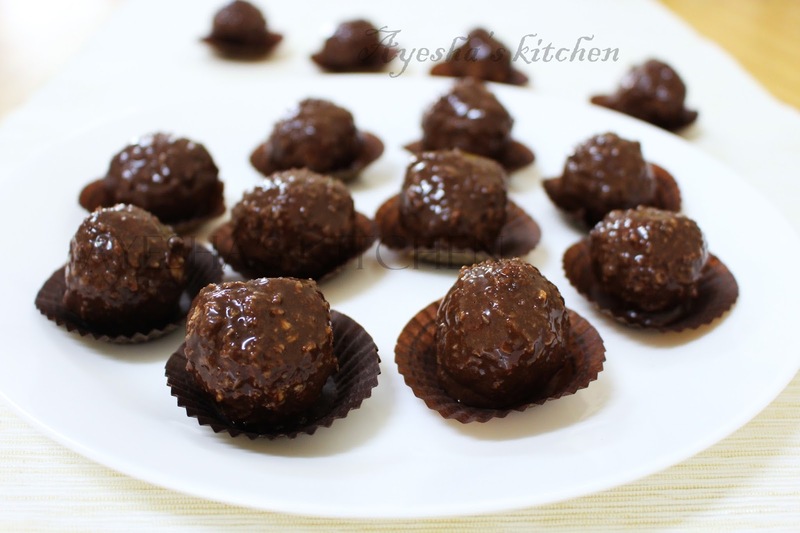 Boondi laddoo, besan ladoo, coconut ladoo, motichur ladoo are some of the most common ladoo recipes. Laddu is often prepared for festivals like Eid, christmas, diwali etc. Desserts is the first thing when i think about Eid recipes. Like so Chocolates is the first thing when i think about Christmas recipes. Coconut ladoo is very popular in India as it is the inevitable sweet for festivals like Holi, Diwali, Christmas etc. As it is one of the quick and easy no bake desserts , i often make this for my family. It attracts the crowd easily with no doubt. The crunchy coconut with the blend of chocolate is really scrumptious. Do try this easy desserts for kids. 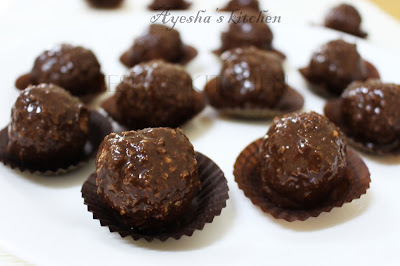 Here is the recipe showing how to make coconut chocolate ladoo / christmas treats or desserts recipes /desiccated coconut recipes / Indian sweet recipes. Chocolate dipping sauce - 6 tbsp ( or as required), you can use any dark chocolate instead to get a thick chocolate coating. Chocolate dipping sauce can be made at home easily using cocoa powder. Refer NOTES given below for the recipe of home made chocolate sauce. Take the desiccated coconut in a bowl and mix it with the condensed milk ( be care while mixing that we need a dough not a cream). Mix well and keep refrigerated for 1 hour. This process is to soak the desiccated coconut well in the condensed milk or milkmaid . Now add the chopped cashews or almonds to this mixture and make small balls with it. Then roll the balls in desiccated coconut which is kept for garnishing. This is optional only but will gives a coconut crunchiness in each bites . Again refrigerate for few minutes for best result. Now take each coconut balls out and dip in the chocolate sauce and then transfer it to a plate. You can dip it in melted dark chocolate mixture for a thick chocolate layer. Keep in freezer for 2 hours. Transfer it to a bowl and mix well. Chocolate dipping sauce is ready!!! !